Hull cleaner ideal for marine and RV fiberglass, metals and anodes. Boat hull cleaning: remove scum line, algae, scale, chalking and light oxidation as a fiberglass boat cleaner or on aluminum boat hulls. 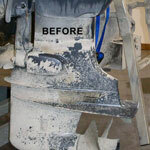 Also remove yellowing, light oxidation and chalking from fiberglass RV exterior. Spray Bio-Kleen Fiberglass Cleaner onto area affected with water spots and water stains. Allow product to dwell for extremely hard to remove stains. HEAVY BUILDUP DIRECTIONS: Spray on surface, let stand 5 minutes, agitate with a soft bristle brush and rinse thoroughly. For heavy lime, oxidation and algae deposits longer dwell time or a second application is recommended. Hot water always increases efficiency. Immediately follow up with an application of Bio-Kleen Polish & Sealant to prevent future build up and create a layer of UV protection and shine. Ready to use or may be diluted per application. 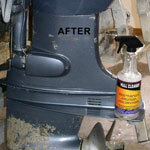 Rust remover- The hull cleaner is the best product I have ever used to remove rust. Just spray it on and wait. No scrubby necessary. Depending on how much rust you have you may have to do multiple applications. Hands-down the best product I’ve ever used! The performance of the product meant my needs for the boat. Was it a lot of work spraying and brushing, yes, however, after three times, most if not all the algae came off. I had a years worth of water spots on a brand new boat, I was having no luck getting them off with other products. This product was a dream come true... sprayed it on, wiped the spots off without any scrubbing. After the microfiber towel was damp with this product, I didn't even need to spray anymore. The spots just wiped off! I'm so thrilled with this product, I will recommend it to anyone. So thankful a friend told me about it. Thank you for bringing my boat hull back to showroom shine. We used this as the 1st step in the cleaning of our boats pontoons, and we were astounded at how well it worked. Took off about 5 years worth of algae/stains and made them look great! I applied the Bio Kleen product to the boat’s hull shortly after being pulled from the water. The first round was applied at full strength the second was diluted for touch up applications. I have to say with little agitation the hull game out absolutely perfect and that is really saying something as the boat sat in the water the entire summer.